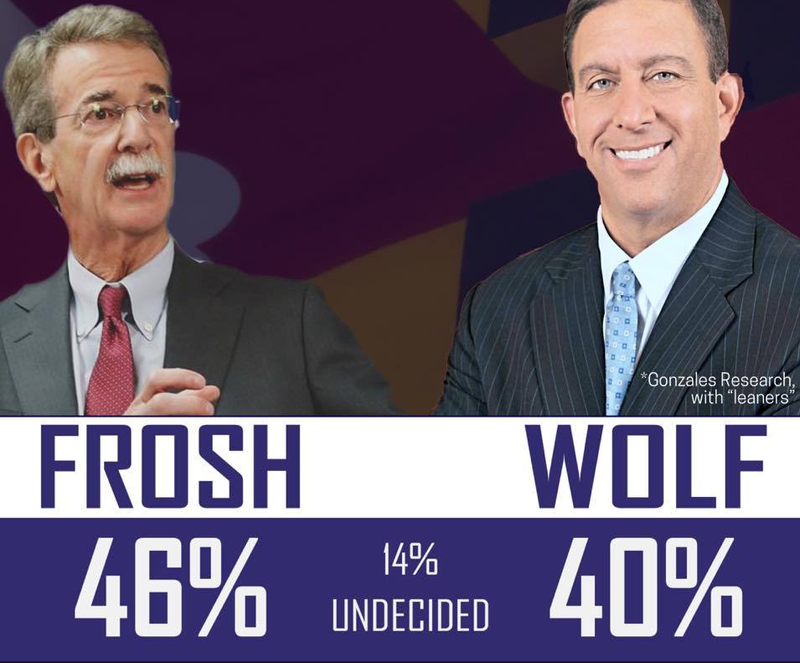 A new Gonzales poll out yesterday showed Republican Craig Wolf surging in the Maryland Attorney General race, only 6 percentage points behind incumbent Democrat Brian Frosh. The narrowing gap brought new attention to the race Wednesday, with Wolf using the poll in a new fundraising pitch. Frosh was in position to win handily just a few weeks ago, although Larry Hogan has proven it is still possible for a Republican to win statewide in Democratic-controlled Maryland. Some attributed Frosh's 23-point collapse to the public perception that he has been entirely focused on Donald Trump and Washington since 2017, instead of Maryland issues. At the same time, Frosh's Trump obsession was thought to be a winning move with Democratic voters statewide. Lol, that's not what Wolf looks like at all. Did you change his coloring or did his campaign feed you this? The guy is orange IRL. "Frosh was the choice of 43 percent of those surveyed by Gonzales Research and Media Services. Republican Craig Wolf, former CEO of the Wine & Spirits Wholesalers of America and a former federal prosecutor, had the support of 34 percent of voters. Nearly one in four voters was undecided." 2:16: God what an idiot - the graphic from the Wolf campaign above the article even says 6%, as do I and the Post. Punch yourself. Polls are BS. All you have to do is look at the 2016 election to know that. It depends on who is taking the poll, what kind of leading questions they ask, what demographic is polled and how many people are polled. You only post one poll. Not meaningful with out other data to compare. Some supporters reading how Wolf is "surging" will just stay home thinking they don't need to bother if he is ahead. What is it with CEOs of wine companies? First we had the ding bat Trone and now Wolf? I hope Wolf isn't as nuts Trone.